This is my red and white version of Bonnie Hunter's Roll, Roll, Cotton Boll. You last saw it on New Year's Day. Since then I've been steadily making the 500 HSTs required. Now that's done and the blocks are coming together fairly quickly. It reminds me of a building project, where for the first half of the project it's just a big hole in the ground, and then all of a sudden it starts growing fast! 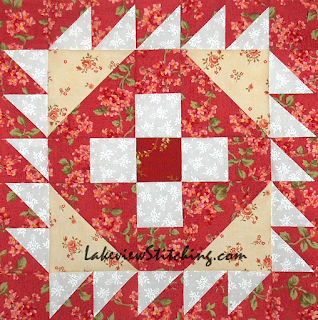 These rosy florals are so fun to work with. This dark pink is from Eleanor Burns' Forever Love collection. I've also used a few fabrics from the Savannah Garden collection from Henry Glass. This red looks even better than I expected cut and sewn. And this is the main Savannah Garden floral in white. I believe the ditsy red print is from my old LQS, now closed for many years, and the white on white blender too. I had planned to make the whole quilt from stash. But, it turned out that I had plenty of cream florals, but none of the reds that I imagined. So, woe, a little online shopping was required. I lost my head at Missouri Star, but I'm certainly not having any regrets now! I like all kinds of fabric, but these florals feel like home. I'll need 25 of these blocks. More to come! What a beauty this one is going to be. Thanks, Jacqueline! I admit I had some doubts, but I'm feeling good about it now. Can't go wrong with florals, imho! 500 HSTs. Not 499. Not 501. Looking good so far. Thank goodness that Missouri Star had what you "needed!" You know how much I adore red. I can't imagine it in any other color way! It is beautiful! Thanks, Terry! I have to say their new website is very good with the "you might also like" suggestions! It's hard to believe it took me a year to decide on just two colours, isn't it? so many HSTs you must be dreaming abut them ab=nd making them in your sleep! Well worth it though a lovely block, wonder about what size the block is don`t tell me it is only 7"
Well, you certainly have a way of keeping the interest alive and well in your quilting; a different quilt every week. Each of them presenting it's own set of challenges, (complicated paper piecing one week, on to a zillion or so HST's). And as always beautiful. Yes, I admit I am spoiled for choice. I call it "cross training!" :D Thank you! It's a fun way to work. They really are lovely reds - and so beautifully softened by the creams and whites. I get the joy of making something so beautiful. This is one of those things I think crosses over your art/use division. Thanks, Jillian! 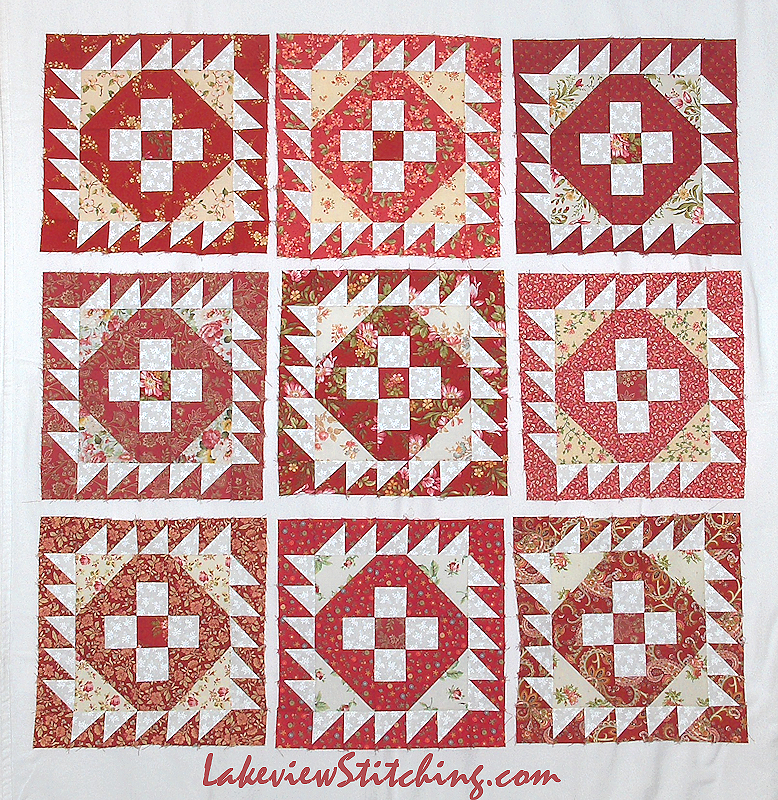 They will blend more when the finished quilt is washed, too. That's my main "use" criterion -- will it survive regular washing? 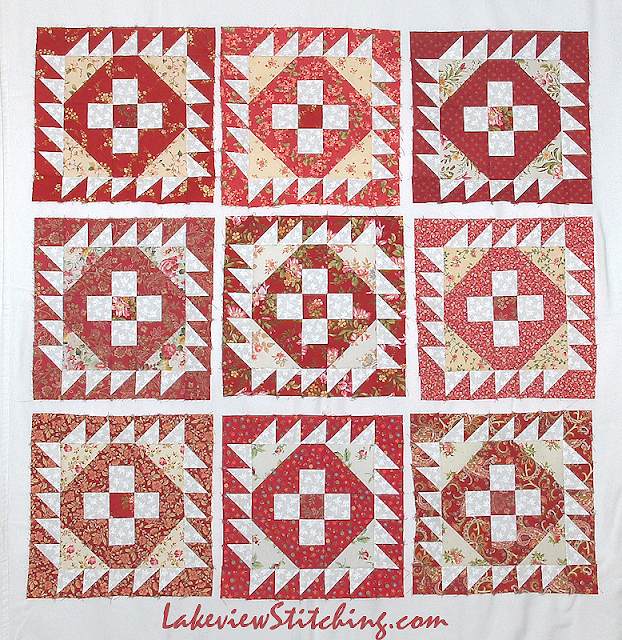 I can understand needing a break from the paper piecing! 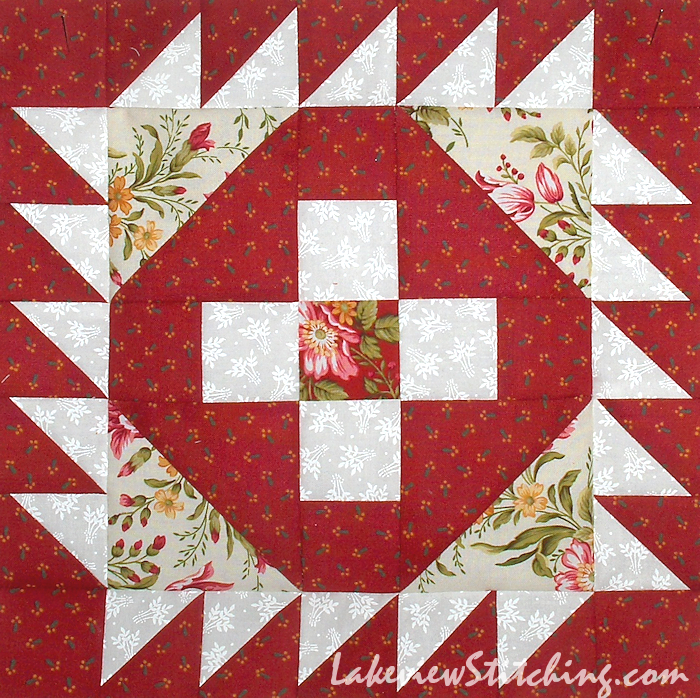 These blocks are just beautiful--I love your fabric choices! I really like how you have a managed a kind of unity with the colours, yet have enough variation to keep things interesting at the same time. I made the Roll, Roll Cotton Boll way back when with a big mish mash of fabrics and loved it but gave it away. I especially liked the pattern. So now I see a pattern I liked in fabrics I LOVE. Your quilt feels so romantic and what they used to call (maybe they still do?) shabby chic - perfect for a bed in a little cottage where roses grow in abundance. Roll, Roll, Cotton Boll has always been one of my favorite Bonnie Hunter patterns. I like yours in red and white. I am currently on hiatus from doing much of anything. Yesterday I sprained my left thumb badly while unloading bags of mulch from the car. It hurts like the dickens and today it is discolored and swollen. I can hardly do anything that requires two hands. Happy Easter and happt sewing! I'll be reading. At least my eyes are working. I love the soft, romantic beachy cottage look to these blocks and the fabrics you're using. I'm always so drawn to this look. I bet it's really, really pretty in person! Reds are my favorites and yours are especially delicious. 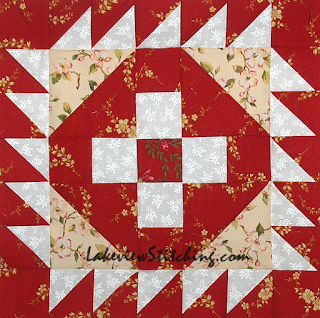 The outer HSTs remind me of a block called Pigeon Toes. I can't wait to see how you put this together.